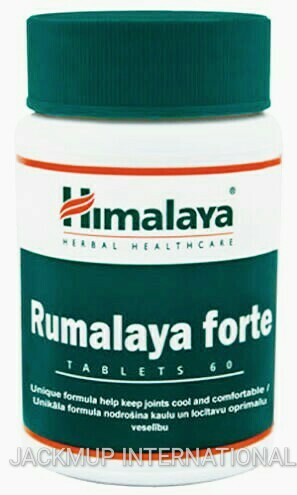 Description:- "Rumalaya forte is a potent and safe phytopharmaceutical formulation that relieves joint and bone aches associated with various orthopedic ailments like Rheumatoid arthritis, Osteoarthritis, Cervical and lumbar spondylosis, Gout, Frozen shoulder. Role of Key ingredients: Boswellia (Shallaki) improves the blood supply to the joints and restores the integrity of blood vessels destroyed by spasms. Boswellia significantly reduces the degradation of glycosaminoglycans and protects the joints. Indian Bdellium (Guggul) is an anti-inflammatory agent and antioxidant that inhibits the formation of nitric oxide, which can cause further oxidative damage to degenerate joints and bones. Rumalaya Forte’s natural ingredients possess potent anti-inflammatory properties that alleviate pain. As an immunomodulator, Rumalaya forte tablet modulates both the humoral and cell-mediated immune response to aches. Rumalaya forte tablet reduces degeneration of glycosaminoglycans (GAGs), inhibits master cytokines and prevents cartilage damage."